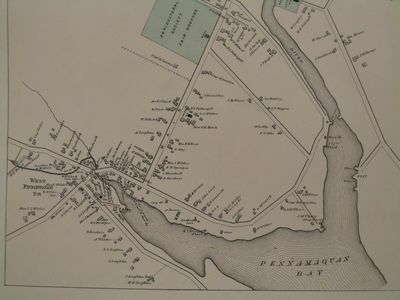 "West Pembroke, Maine, Map " by George N. Colby & Co.
George N. Colby & Co.
A section of a map of Pembroke Village that appears on page 61 of Atlas of Washington County Maine, by George N. Colby and Company, Houlton and Machias, Maine, 1881. Cash Account records within the Willis Carter diaries (SpC MS 84) include lists of purchases at E. Wilder & Sons Store, H.S. Bridges Store, and other businesses that appear on this map.